Three-Ingredient Oreo ice cream cake is the perfect treat to cool down this summer. It’s so easy to make yet never fails to impress! 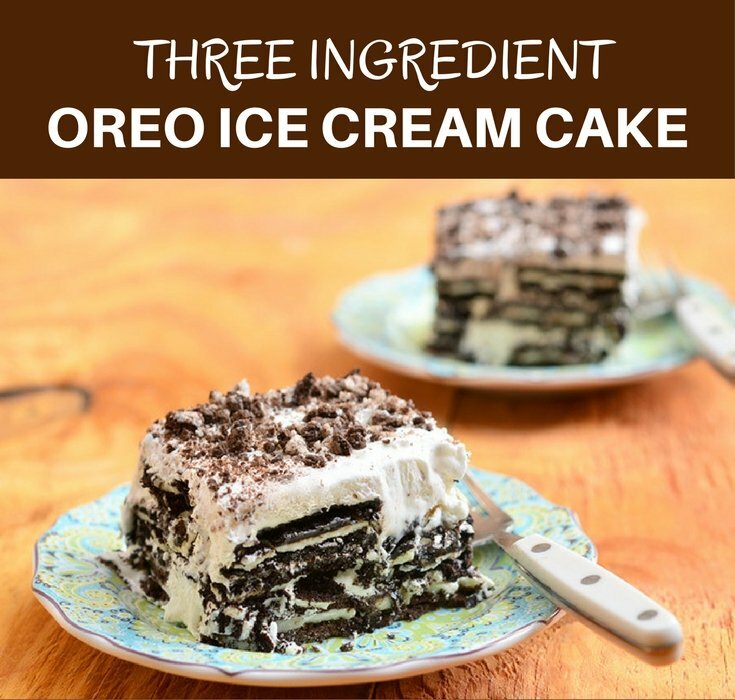 Yes, I admit, calling this a three-ingredient Oreo ice cream cake is a bit of a stretch. There is no ice cream involved or cake for that matter. But then, my friends, that is the beauty of this sweet frozen treat. A few hours in the freezer, the Oreo cookies soften to cake-like texture and the whipped cream hardens to ice cream-like consistency. The perfect summer dessert can’t get any simpler than this! 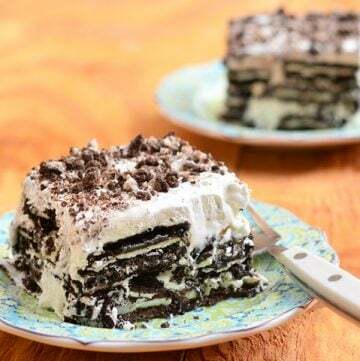 With only three ingredients and less than 10 minutes of prep time, you get an amazing Oreo ice cream cake that’s sure to be hit with kids and adults alike. The best part is, you can easily double (or triple!) the recipe to serve a crowd or to satisfy anytime sweet cravings. Looking to make more ice cream goodies? Try my two-ingredient dulce de leche, chocolate or strawberry swirl cheesecake ice creams. They’re just as easy to make and no churning or ice cream maker needed. Enjoy! 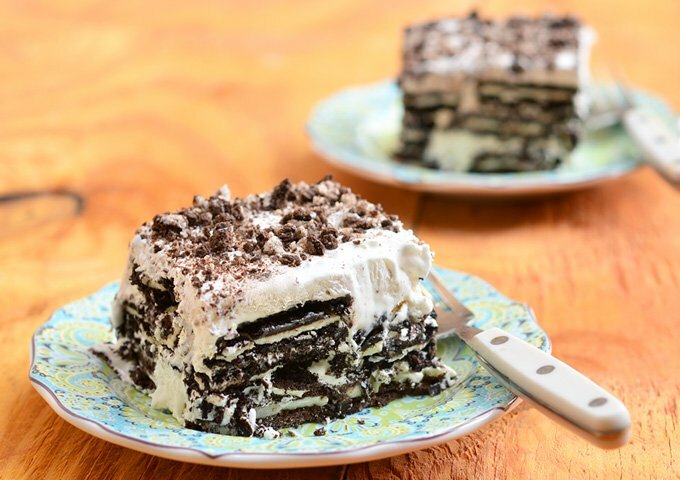 Three-Ingredient Oreo ice cream cake is the perfect treat to cool down this summer. 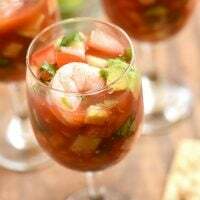 It's so easy to make yet never fails to impress! In a bowl, dip Oreo cookies in milk for about 5 to 10 seconds or until just softened. In a 8 x 8 baking dish, arrange softened Oreo cookies in a single layer to cover the bottom of the dish. Spoon whipped topping and spread over cookies. Repeat layering with remaining cookies and whipped topping, ending with whipped topping. Crush remaining Oreo cookies and sprinkle on top of whipped topping. Cover tightly with plastic film and freeze for about 4 to 5 hours or until firm. To serve, thaw out for 1 to 2 minutes and cut into squares. YUM! I dipped my thin Oreos in strong coffee instead of milk, used real cream with 1/2 tsp cornstarch for stabilizer, did not freeze & let it sit overnight. Thanks for the inspiration! I will probably use shaved chocolate for garnish next time! Thank you for the tips, Heather. Love the idea of dipping in coffee as I am sure it will go great with the chocolate flavor. I make these, drizzle caramel ice cream topping on top of cool whip, layer 2-3 times ending with cool whip & ice cream topping. I do not freeze. The longer it sits the better it gets. Also use double stuff cookies. I make this,layer cookies that have been just turned over in the milk, then cool whip, drizzle caramel ice cream topping, layer as many times as you want, usually 2-3 ending with cool whip and ice cream topping, also use double stuff Oreos. I don’t freeze this and the longer you keep this the better it gets. My kids love this. I’ve never tried it with caramel ice cream topping but what an excellent idea! I can just imagine how great it will be with the whipped cream and cookies. Thank you so much. Have also used the chocolate chip cookies with coconut, and used cool whip and chocolate syrup. My grandchildren love this. Thank you for a wonderful idea. I am going to be making your version this weekend.